What did Pope Francis say in the U.S.A.? Despite the clear statement of the Holy Father Pope Francis that "the unfailing commitment of the Church in America to the cause of life and that of the family, which is the primary reason for my present visit," the media will continue to frame the Pontiff's words toward a political bent, either in support of the policies of the Democrat party or in opposition to those of the Republican party. At the same time, ignoring his statement that "I do not speak to you with my voice alone, but in continuity with the words of my predecessors," they will continue to frame his works as a break from the teaching and tradition of the Church. Both of these attempts, of course, are quite false (thought there maybe something supported by either party he might agree with, inasmuch as it conforms to the teaching of the Church). Rather than rely on the media to present the words of the Holy Father to you and to interpret them for you, read his words for yourself. For reasons I do not understand, neither the web site of the Holy See or of the United States Conference of Catholic Bishops have posted the texts of the Pope's addresses thus far in our nation. News.va, however, has released the full texts at the end of brief reports. Homily - 27 September 2015 - On the Apostolic Journey of the Holy Father Pope Francis to the U.S.A. The preacher today is presented with a seemingly impossible task, namely of discussing the Apostolic Journey of His Holiness Pope Francis to these United States of America to, in his words, “celebrate and support the institutions of marriage and the family at this, a critical moment in the history of our civilization.” The great number and length of the addresses the Holy Father has given – and will give - further complicate this task (31 single-spaced pages before he left for Philadelphia), not to mention the many topics he addressed and the fact that each address seems to build upon the previous one. But something else significantly contributes to the difficulty posed to the preacher today: the various competing and contradictory ways in which the Holy Father’s words and actions continue to be presented – and even claimed – in much of the media and elsewhere. Perhaps you saw a cartoon that illustrates this difficulty well. 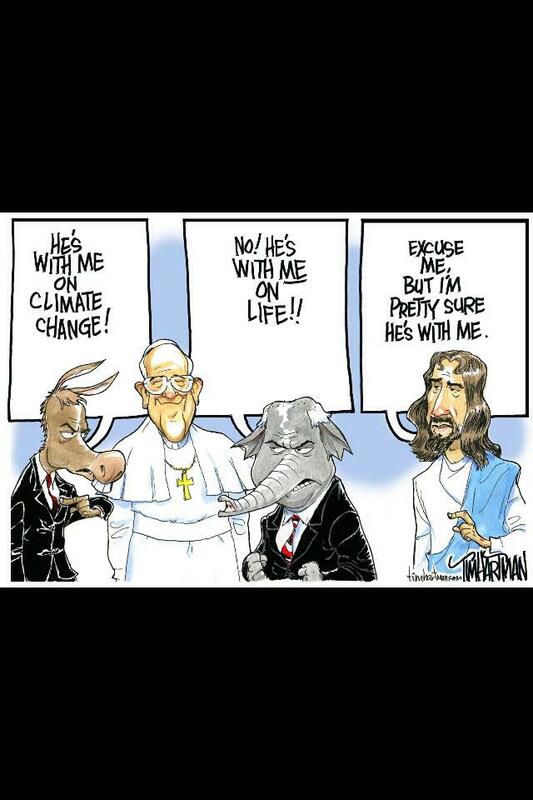 The cartoon I have in mind shows Pope Francis standing between a donkey and an elephant. The animal representation of the Democrat party says, “He’s with me on climate change!” To this claim, the animal representation of the Republican party responds, “No! He’s with me on life!” Meanwhile, we see Jesus standing quietly off to the side, saying, “Excuse me, but I’m pretty sure he’s with me.” These sentiments of those who claim the Pope is on “their” side forget the Pope’s own words, that “harsh and divisive language does not befit the tongue of a pastor, it has no place.” Because a pastor is to help his sheep grow daily in holiness, harsh and divisive language likewise does not befit the tongue of the flock, or have a place in its heart. While the cartoon may make us laugh, the attitudes it expresses are all too real in the culture and climate of our day. Rather than listening to the Holy Father’s encouragements and challenges, we may be tempted only to hear him say what we want him to say – to listen to him in terms of our politics, of our preferences and opinions; what we do not want him to say, what contradicts our politics, preferences, or opinions, we are tempted to scoff at or to simply ignore. Here we would do well to remember these words of Jesus. “But I say to you,” he said, “whoever is angry with his brother will be liable to judgment” (Matthew 5:22). Saint John puts it perhaps a bit more bluntly: “Everyone who hates his brother is a murderer, and you know that no murderer has eternal life remaining in him (I John 3:15). We must, then, learn to open our ears and our hearts first to Jesus and his Church and only afterwards to consider our political affiliation, to shape our preferences, and form our opinions. In this way, the hope of Pope Francis that we might recover “that spirit of cooperation, which has accomplished so much good throughout the history of the United States” may be fulfilled. Without a doubt, the American people have extended a very warm welcome to Pope Francis, and for this we should be deeply grateful. At the same time, however, we might wonder whether the Holy Father has been welcomed not so much as the Successor of Saint Peter, but rather as a famous celebrity, as one whose smile captivates and whose willingness to take selfies is admired. People perceive Pope Francis as somehow different from his predecessors, even though, by and large, he says and does what they said and did. Pope Francis spoke in the halls of the powerful of our nation and the world and he walked among the unknown, but if the Pope is just another celebrity, why should anyone – great or small – care at all what he says about anything or among whom he walks? The attention of the world is on Pope Francis because his charisma and simplicity attract others, but will his words be given the honest, serious consideration they deserve? He deserves to be listened to as a prophet, because the Lord bestowed his spirit on Pope Francis when he was elevated to the sacred ministry through his reception of the sacrament of Holy Orders and even more so through his election as the Bishop of Rome (see Numbers 11:29). We have to remember that the Pope is not just one teacher among many; he either is he who he says he is – the Vicar of Christ on earth – or he is a liar and a fraud. If he is the Vicar of Christ on earth, we owe deference to his teachings and must give them serious and prayerful consideration when making moral decisions, decisions which necessarily include politics, preferences, and opinions. If he is, on the other hand, just a fraud, there is no reason to pay any attention to him at all. As Catholics, we know that Christ Jesus established the office of Peter when he entrusted the keys to the kingdom of heaven to the Prince of the Apostles (see Matthew 16:19). Peter did not take these keys with him to the grave; rather, the Church has entrusted them to each of his successors who teach, sanctify, and govern the flock of Christ in the name of the Good Shepherd. This is why we listen to Pope Francis – and, indeed, to each of the Popes – not as a celebrity, but as a true prophet who speaks in the name of the Lord. Go out to others and share the good news that God, our Father, walks at our side. He frees us from anonymity, from a life of emptiness, and brings us to the school of encounter. He removes us from the fray of competition and self-absorption, and he opens before us the path of peace. That peace which is born of accepting others, that peace which fills our hearts whenever we look upon those in need as our brothers and sisters. But how do we do this? How can we go out and look upon others – on those with whom we might disagree and on those who remain anonymous to us – with the eyes and love of Jesus? Jesus keeps knocking on our door in the faces of our brothers and sisters, in the faces of our neighbors, in the faces of those at our side. Dear friends, one of the most effective ways we have to help is that of prayer. Prayer unites us; it makes us brothers and sisters. It opens our hearts and reminds us of a beautiful truth which we might sometimes forget. In prayer, we learn to say “Father”, “Dad”. We learn to see one another as brothers and sisters. In prayer, there are no rich and poor people, there are sons and daughters, sisters and brothers. In prayer, there is no first or second class, there is brotherhood. It is in prayer that our hearts find the strength not to be cold and insensitive in the face of injustice. In prayer, God keeps calling us, opening our hearts to charity. This must be our mission as sons and daughters of God, not to foster division and discord, but to foster instead peace and unity. To be sure, this is a noble challenge, but if we confess our sins, our lack of love, and say with the Psalmist, “from wanton sin especially, restrain your servant,” the Lord will pour out his grace upon us, he will fill us with his love, and we will be able to look with love upon everyone we meet. Let us, then, take up the call of Pope Francis to go forward in this mission in mercy and love (Psalm 19:14). Amen. Pope Francis, Address at the Welcoming Ceremony on the South Lawn of the White House, Washington, D.C., 23 September 2015. Ibid., Address at the Meeting with the Bishops of the United States of America, Cathedral of St. Matthew, Washington, D.C., 23 September 2015. Ibid., Address to the Joint Meetingof the United States Congress, Washington, D.C., 24 September 2015. Ibid., Meeting with the Bishops of the United States. Ibid., Greeting to the Charitable Center of St. Patrick Parish and Meeting with the Homeless, Washington, D.C., 24 September 2015. Ibid., Homily at Madison SquareGarden, New York City, 25 September 2015. Ibid., Greeting to the Charitable Center of St. Patrick Parish. As I sit in Quincy watching the Holy Mass for the Canonization of Saint Junipero Serra in Washington, D.C., I am reminded that different personalities have different ways of doing things. What called this to mind is the manner in which the Holy Father Pope Francis received the offerings from the faithful: standing, quietly and quickly, without any words spoken to - or heard from - those who presented to him the offerings of bread and wine. Personally, I prefer the manner in which Benedict received the gifts (though, admittedly, I only say a quiet "Thank you" to those who present the gifts when I offer the Holy Mass). My preference for one manner, however, does not mean the other manner is somehow bad or inappropriate; it simply means that I prefer one way over the other. This is a simple lesson we in the United States of America need to learn, or at least to remember.